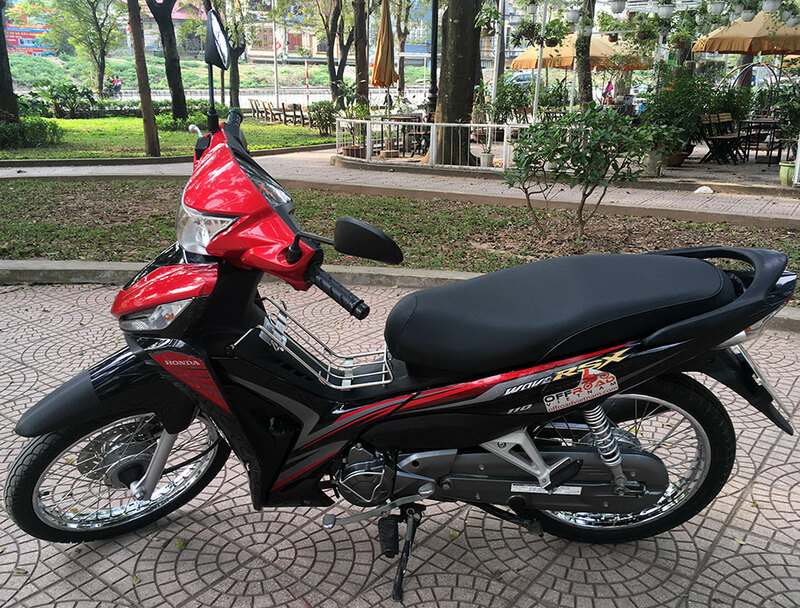 For Honda Wave series 110cc, the monthly rate is limited to 1,500km/month and ride in or near Hanoi. On the other hand, the daily rate has no mileage limit. In other words, rent by day you can ride anywhere you want. We have been providing near new or latest model of scooters in Hanoi. Only genuine Honda products, no other brands or Chinese fakes. Please take these details into account when you decide which bike to hire. Ask about bike model and year of manufacturing don’t just look at prices. In general, our rates are competitive and the quality is best. – These Honda Wave series are not really suitable for riding two up on one bike because of the HP, seat, and luggage added. Ideally, riding solo is the best option. If you have to ride two up, relax often and don’t ride long every day, especially after dark or on rainy days. With improved technical enhancements and a totally new 110cc engine, this Honda Wave is the new king ruling Vietnamese urban roads. All bikes are from 2012 to 2015 models. No shop in Hanoi has or uses newer bikes than ours! If you know more about our other Honda semi-automatic scooters for rent in Hanoi please follow this link. I am in Hanoi in December 2018 for 4 weeks. I want to rent Honda Wave for tours in North Vietnam. I have a Wave in Germany by my own. It is possible and what is the price? Dear Hans. Yes, we have a Honda Wave 110cc for 150$US/month if you ride on long trips. To make sure you have bikes when you come, we would like to have bikes booked and paid for before they are not available. If you wait until you arrive in Hanoi then there is no guarantee that the bikes you want are available. We will send instructions if you agree to proceed. You can pay with credit cards online, Western Union cash transfer or even a traditional bank transfer. Hi There. I live in Cam Pha and I am looking for a reliable bike. I would like one that can handle some off road as well, and one that is easy to drive for a smaller person. I am thinking Honda wave, but I not sure if that is the best choice? Honestly, Honda Wave is a scooter and was designed for city traffic. It has a poor suspension and weak power so if you ride off-road it’s quite uncomfortable. How tall are you? If over 1.65m you can select a Honda XR125/150L and it’s the best entry off-road motorbike. In any case, try to avoid cheap Chinese copy as we mentioned here. Hi, I want to BUY a bike to tour SE Asia for a few months. Any suggestions? Hello Mark. Please have a look at this link. Then tell us which bike you want to purchase. I’m looking to rent a new model Honda Wave 110cc when I get back to Hà Nội on the 4th of June. I’m looking to rent for three months. Hello David. We will meet on June 4th and a Honda Wave will be available as agreed. Thanks.